Auckland – City of the Volcanoes has the largest number of volcanoes in New Zealand. Auckland is the largest city in New Zealand, located on the north island. In the Māori language, Auckland is called Tamaki Makau Rau, meaning “the unmatched city.” Rangitoto Island is a small island with a volcano crater and the youngest among the 48 largest volcanic craters in the Auckland region. Rangitoto is 30 minutes from Auckland by ferry. Rangitoto has many amenities, such as lodging, restaurants, and markets. Rangitoto has both walking and train tours. On the one hour tour, you can see black lava caves, scenic small islands, Waitakere Ranges Park, and Hunua Ranges. For you mountain bike lovers, Rangitoto has the 75 km Hillary Trail, which takes about four days to complete. The trail’s start line is in Arataki and the finish line is in the Gulf of Huia. For you who love water activities, there are kayak tours in the ocean around the island. Mount Eden (Maungawhau) is the highest mountain in Auckland. It is 640 feet (196 meters) above sea level. The volcano has three craters, each about 164 feet (50 meters) deep. Maori people live on this volcatno. This mountain area also has a garden called the Garden of Eden, which has plants and flowers native to New Zealand. Here you can also see a collection of volcanic rocks from Mount Eden’s crater. One Tree Hill (Maungakiekie) is another volcano in Auckland. This mountainous area is the largest settlement of the Maori tribe in New Zealand. Maungakiekie is a very large tourist area, with a pedestrian paths, a large forest, picnic areas, and the volcano attractions of Maungakiekie. As an adventurer or a leisurely sightseer traveling overseas, it is important to have travel and medical insurance for peace of mind. 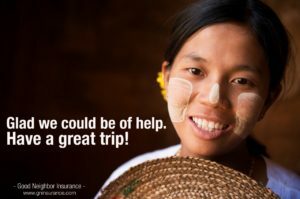 Check out our travel and medical insurance plans at www.gninsurance.com. Contact one of our insurance specialists at 1-866-636-9100 for insurance options for all your traveling needs while on vacation overseas.